This week, small business software company IP Commerce landed its first round of funding since it was founded in 2007. The amount was undisclosed. The company’s flagship product, Commerce Sync, helps its 7,000+ small business clients eliminate manual data entry by syncing sales information with their accounting platform. IP Commerce holds partnerships with Clover, Stripe, Square, Quickbooks, and Xero. IP Commerce company will use the funds to expand its workforce and enhance the functionality of Commerce Sync. First Data’s Peter Karpas, global head of SMB Solutions, has been appointed to IP Commerce’s board of directors. IP Commerce is based in Denver. 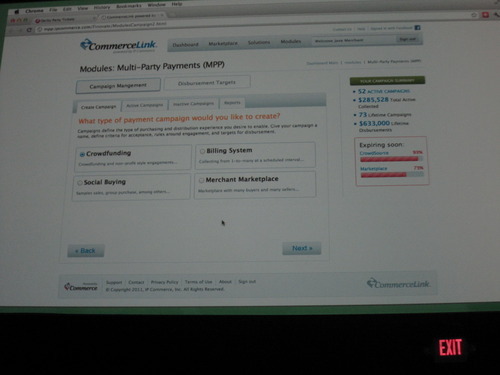 The company debuted its Multi-party Payments Commerce Playlist at FinovateSpring 2012. MasterCard and TransferWise talk about the “future of money and credit” with TechCruch at Davos 2016. Let’s Talk Payments features Betterment in a roundup of fintech startups focused on reducing fees for retirement savers. OnDeck enters referral agreement with Opus Bank to power SMB lending. BehavioSec to power behavioral biometrics for TeleSign. Encap Security to support Samsung fingerprint scanner as part of version 3.0 of its Smarter Authentication technology. See Encap at FinovateSpring 2015 next month in San Jose. Dutch banking group ABN AMRO to deploy wealth-management solution, WealthSuite, from Temenos. Top Image Systems wins recognition at 2015 IT Innovation Awards (IT Innovationspreis) for MobiPAY. PayPal partners with Tillster, an online ordering platform. Green Dot names MasterCard its exclusive transaction processor and network gateway. American Banker: New Moves by Coinbase, Ripple Advance Digital Money Tech. Currency Cloud appoints former Deutsche Bank CIO, Mitchel Lenson, as a non-executive director. IP Commerce launches new version of Commerce Sync to automatically transfer sales info from a POS system or e-commerce solution into accounting software on a daily basis. InComm partners with Russian internet giant Mail.Ru Group. Stratos now shipping its all-in-one smart credit card. Come see Stratos at FinovateSpring in San Jose. Open Source Project.com features Open Bank Project. PYMNTS.com, a website owned by Business Wire and Market Platform Dynamics, recently published the winners of the 2013 Innovator Awards. Innovation: A new way to send money anywhere, at a flat fee, instantly, leveraging the prepaid rails. Description: Combining mobile payments with social media channels to empower and inform the user in everyday purchases. Innovation: PayPal POS Initiatives that leverage its worldwide digital wallet accountholder base. Innovation: The consumer’s advocate for demystifying credit with a range of tools and information resources to help them monitor and manage their financial health. Innovation: Online working capital for small businesses. Innovation: Small business payment platform integrated with Quickbooks. Innovation: Platform-as-a-Service that powers POS 2.0 commerce solutions. Innovation: Offers consumers “more time to pay” their bills on time to help avoid late fees, overdraft charges, service termination and high cost loans. Innovation: Enables consumers to shop online and pay with cash easily for a wide range of goods. Innovation: Cloud-based, small business platform that integrates invoicing and payment acceptance in one system. Innovation: Alternative business financing that helps businesses tap into the capital it needs to run the business. Innovation: Mobile checkout service that enables one touch payments across multiple applications. Innovation: OneID lets people sign in without usernames and passwords, yet delivers authentication solutions with non-repudiation, keeping both people and businesses safe from today’s biggest identity and personal information threats. Innovation: Aggregates financial account information and allows users to manage their money in one place, online or with a mobile device. Innovation: Brings together investors with creditworthy borrowers to reduce the cost and complexity of traditional lending. Innovation: Reinventing personal banking with modern online and mobile experiences, no surprise fees, and great customer service. Innovation: Mitek’s patented mobile imaging technology allows users to remotely deposit checks from anywhere, at anytime by snapping a picture with their camera-equipped smartphone or tablet, and has become the “gold standard” for mobile check deposit. 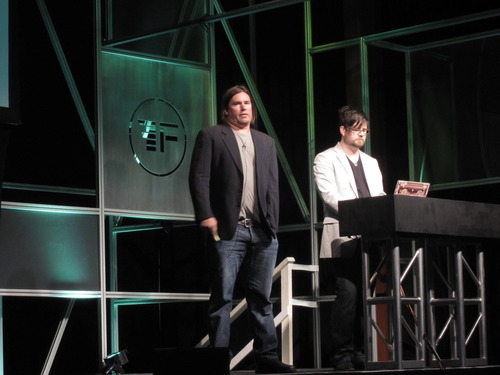 Google Director, Russ Laraway, named SVP of Merchant Sales at FreeMonee. American Banker describes the effect of Plastyc’s Kindle Fire app on underbanked consumers. Business Insider points out how SimpleTution & Cartera Commerce are hacking the financial system. IP Commerce launches app development challenge for next-gen POS app. Bank Technology News compares how Plastyc and Mitek use tech to serve the underbanked. American Banker takes an in-depth look at SimpleTuition’s SmarterBank. Dwolla builds payment fees comparison tool. Cachet Financial Solutions and eDOC Innovations partner to provide mobile deposit to Credit Unions.